I grew up in a household that trained me to love baseball. My father played little league his whole life. My mom played softball growing up. It was only right that they passed on their love for the game to their children. I always enjoyed throwing the ball around, but for a majority of my childhood I was more interested in dancing, basketball, and soccer. My brother started playing t-ball as soon as he was of age, though. One day, my friend and I decided that we wanted to play softball for the local little league. That first year in fifth grade turned into a seven year commitment to a sport I learned to love and hate. Playing softball made me love the game of baseball even more. I learned to watch closely, seeing the minute details rather than the full picture. I learned to love watching the pitches come in. My favorite sound in the world became the sound of the ball smacking against the catcher's mitt. Going to games became my form of entertainment, whether they were my brother's little league games or the local minor league team's games. I went to my first major league game in middle school. I saw the White Sox vs. Red Sox in Chicago, and forever referred to it as the Battle of the Pink Sox. After sitting in U.S. Cellular Field for those few hours, something inside me clicked, and I knew that I would never get sick of the feeling of sitting at a baseball game. Since that game, I've made it my mission to go to as many fields and games as possible. One of my favorite things about where I go to school now is that we have a major league team. I grew up having only a minor league team. Needless to same, I'm extremely happy to have the Indians downtown with me. At the end of the 2013 season, I managed to go to 4 games in 2 weeks and boy, was that a treat. If I wasn't the dozen or so blocks away from the field, I'd watch the games on television or would keep up with my favorite app during the MLB season, At Bat. I waited (im)patiently through the winter months for the 2014 season to begin. I wasn't able to attend the home opener against the Twins, but I did get the opportunity to attend the rest of the series on Saturday and Sunday. I am bad luck for the Indians (they always lose when I go! 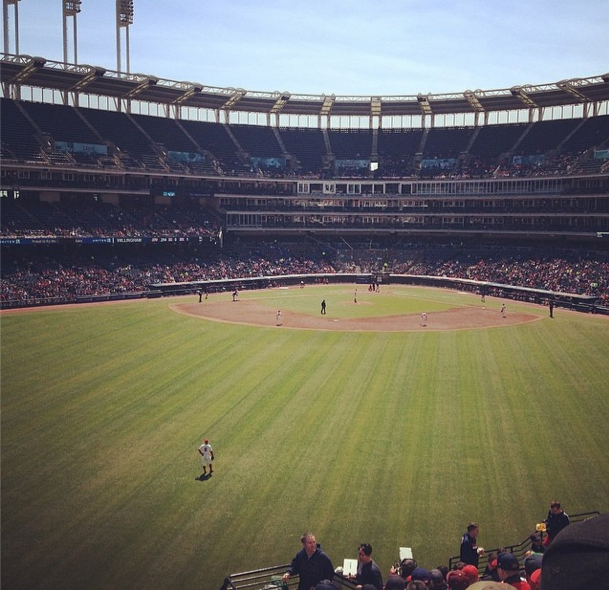 ), but I can't myself away from Progressive Field. Baseball is my life, whether I like it or not. Does this explain why Moneyball is my favorite movie of all time? Is anyone else as excited for baseball to be starting up again? I want to know who you guys are rooting for this season! 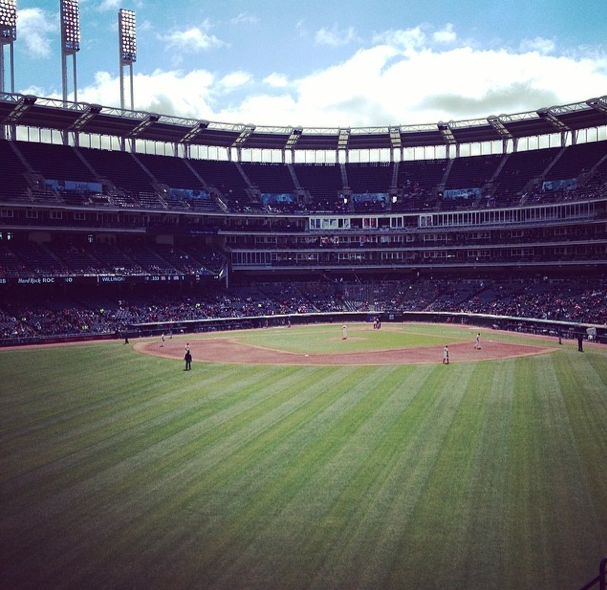 As expected, I want my Indians to do well this year and make it even further into postseason! I always like to see the Red Sox, New York Mets, and Athletics win as well. Just not when they're playing the Indians ;).